Do you believe, like we do, that marketing is a necessary activity for any successful business? Here’s an even more important question: do you believe marketing is an expense or an investment? How you answer the second question may go a long way in determining how successful your marketing campaign or strategy is. And it may be the reason you’re not reaching the potential customers you want. Expenses, like utilities and rent, are something all businesses must pay. Because you need water and electricity and a physical building for your business, these expenses are obvious needs. You do your best to keep them at a reasonable cost. At the end of the day, however, you have to accept them and they become a normal part of your balance sheet. Unfortunately, some people see their marketing like they see their utilities. If you allow your marketing to be seen as an expense, you run the risk of seeing it like your utilities–you don’t pay much attention to it and you want to keep the cost down. You’re not thinking about your audience or optimizing your message, and you won’t reach your target audience. Conversely, if you see marketing as an investment, you understand marketing’s true purpose: to help you grow your business. Having the investment mindset gives you a greater sense of commitment and responsibility. You see the potential in your business and therefore you are willing be mindful of the decisions you make surrounding your marketing. Specialized marketing like this will ensure you reach the potential customers who will help your business flourish. Set goals – align your marketing and business goals to ensure all areas of your business are working in the same direction. Develop a marketing strategy – a strategy gives you a map to follow and prevents you from straying too far off course. Track your progress – review the level of engagement so you know what types of content works best and where you can improve. Ask for help – marketing your business can be tough. Asking for help can make the most of your marketing investment. 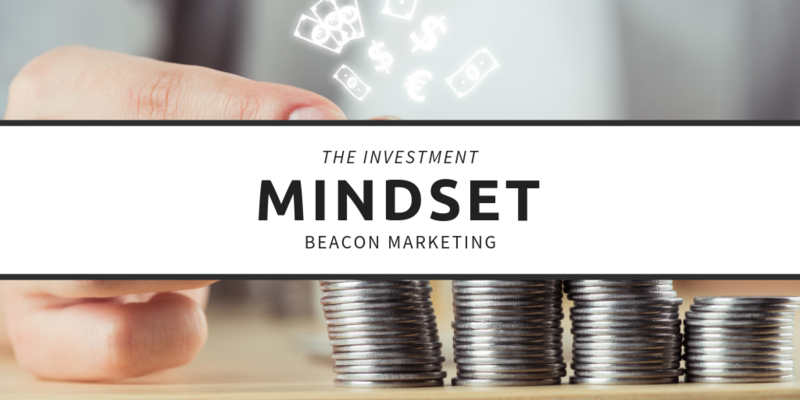 Need help ensuring you have the marketing mindset? Contact BEACON MARKETING for a FREE consultation! If you view your marketing as merely an expense that must be paid, you run the risk of a marketing strategy that is not aligned with your goals and does not reflect your business. The investment mindset allows for conscious participation from all parts of your organization. If this happens, you will be well on your way to finding marketing success.